1.In a bowl, add boiled corn, orange, pomegranate, chopped mint and chopped capsicum. Mix them well together. 2.Add tamarind extract, salt, mustard sauce, chaat masala, few boondies, chopped coriander leaves, cumin, chili powder and lime. 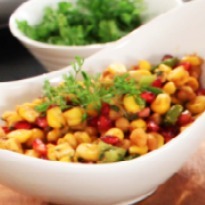 3.Mix them all well together and your corn and pomegranate chaat is ready to eat.